I’m a little sad. I always feel this way as summer winds down. Even though we had some scorching hot days this month, I’ll take them every time over the coldest winter days. When it’s hot, you can go out at night, you don’t need layers of clothing and no worries about black ice. I know cold-weather folks have a different point of view and I’m OK with that! I can’t believe we’re more than halfway through August. I still wonder what happened to June. And July. If you misplaced part of the summer and feel it’s ending too soon like I do, here are 6 summer-bucket-list ideas filled with lots of tips to rock the rest of summer. Do fun warm-weather activities you’ve been meaning to do: dine al fresco, swim in an outdoor pool, nap on the hammock, discover walking trails in the park, shop at an outdoor farmer’s market, do yoga by a gentle waterfall. Retrain your brain: listen to inspiring TED talks, read an interesting biography, turn off your devices for a day, do challenging crossword puzzles, write a guest blog post. Tap into your inner-child: ride on park swings, sit outside and draw in a coloring book for adults, build a sand castle, fly a kite, climb a tree. Prepare for September when life gets busier by completing the summer project(s) on your to-do list: organize the garage and get rid of all clutter, seal the deck, clean the windows inside and out, paint a wood fence. Stretch it out: September is the most beautiful month of the year here in the northeast. At least I think so. It’s warm during the day, cool at night and not too humid. 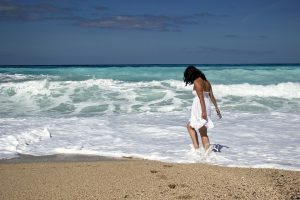 Go down the shore – the crowds are gone, the water’s still warm, and enough restaurants and activities remain open – to walk in the surf and collect some pretty seashells. Doing things for fun and inspiration feeds your soul. Completing a large project or two results in a satisfying sense of accomplishment. Ending summer on a positive note starts autumn on a positive note. Keep it going! Have a happy, healthy, fun and safe Labor Day holiday! previous post: Do You Know What’s In Your Wallet? next post: OMG, What Do I Do First?